On Monday 15th April, the first day of Holy Week, the cathedral of Notre-Dame de Paris was ravaged by a terrible fire. This was a drama which invited us to pray unceasingly, and without being discouraged. Shortly before 8pm, the burning spire collapsed into the nave of the cathedral. The fire, which had broken out around 6.50pm in the timbers of the roof, was overcome by about 3.30am, according to the Paris fire department. Two-thirds of the roof has been destroyed. Ravaged by flames in the night of 15th-16th April, the building - the most visited in Europe, welcoming between 12 and 14 million visitors and pilgrims each year - had stood through history and survived countless events, from the French Revolution to the Second World War. An enquiry into ‘involuntary destruction by fire’ has been opened. “The shocking sight of Notre-Dame in flames reminds us of the dramatic reality lived by too many Christians throughout the world”, stated Fr Yves Genouville, French ecclesial assistant to Aid to the Church in Need. “But at the end of a night of sorrow, a striking image: in the midst of smoke and ash, despite the chaos resulting from the flames, the Cross appears, intact. The glorious Cross of Christ, at the foot of which so many pilgrims have come to leave their prayers. The Cross of Christ, at the foot of which Mgr Fridolin Ambongo, Mgr Theodore Mascarenhas, Sr Mona Adhem, and so many others came, during the 2018 ‘Nuits de Temoins’, to leave the sorrows and hopes of a Church faced with the folly of Evil. The Cross of Christ, today weighed down, at the foot of which stood Mary, his Mother, Our Lady, to whom the cathedral of the Paris archdiocese is dedicated. Guided by this hope, at the start of this Holy Week, as we approach the paschal solemnities, ACN invites all to watch and pray for the Church in France and for the universal Church; to watch and pray at the foot of the cross, at the side of Our Lady, and without discouragement. Each year, the pontifical foundation receives more than 800 requests to support formation projects, subsistence aid, building or transportation projects of religious sisters in 85 countries. Among others, ACN supports over 4,500 religious sisters to ensure that they can continue their monastic lives as well as carry out their pastoral and social work caring for the sick, orphans or older people even in those regions where they do not have any way of earning a living. For example, this is the case in Ukraine, Russia and in crisis-ridden Venezuela. ACN receives more than 800 requests to support formation projects, subsistence aid, building or transportation projects of religious sisters in 85 countries. A large number of convents have been destroyed or severely damaged, not only in war zones such as Iraq, Syria, the Central African Republic and South Sudan but also after natural disasters such as the earthquake in Mexico. It would be virtually impossible for religious sisters to carry out their work in these regions without rebuilding aid from ACN. According to the figures published in the Statistical Yearbook of the Church, there are about 660,000 women who are living in religious communities throughout the world and have dedicated their lives to prayer and service to those most in need. The charity gives direct support to more than 11,000 sisters. In addition, there are other religious women who benefit from assistance for construction, transport and pastoral projects. Even though the number of vocations to orders is declining most notably in Europe and America, the number of vocations continues to grow in Africa and Asia. This is why more than 80% of all projects supported by ACN in the area of formation for religious sisters and novices are on these two continents. This aid benefits more than 5,700 sisters. In accordance with their charisma and their history, the foundation pays particular attention to the contemplative orders. As is written in the Apostolic Constitution Vultum Dei Quaerere issued by Pope Francis on the contemplative life of women, this life “is rooted in the silence of the cloister; it produces a rich harvest of grace and mercy” and represents “the praying heart” of the church. According to the Congregation for Institutes of Consecrated Life, there are about 40,000 religious sisters in contemplative orders throughout the world; half of these are living in Europe. 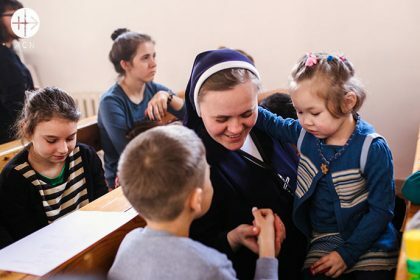 For this reason, 80% of the aid granted by ACN to contemplative orders supports cloistered sisters in eastern European countries who continue to find themselves in dire economic and spiritual need due to their communist past. There are about 660,000 women who are living in religious communities throughout the world and have dedicated their lives to prayer and service to those most in need. During the Lenten season, ACN and its 23 national offices would also like to express their appreciation for all of the religious sisters who fulfil their mission in dangerous situations or who have sacrificed their lives for the people entrusted to them. A few examples are the four religious of the “Missionary Sisters of Charity” who were murdered by jihadists in Yemen in 2014 or the two religious sisters who were killed during the extreme violence that was unleashed in Haiti and South Sudan in 2016. And not to forget the Columbian missionary Cecilia Narváez, who has been held hostage by Al Qaeda in Mali for two years. Rome/Königstein, 5 March 2019 – The March edition of the pope’s video is dedicated to the persecuted Christians who live in countries that do not guarantee religious freedom and human rights. The video is produced by the Pope’s Worldwide Prayer Network in collaboration with the international foundation ACN (Aid to the Church in Need). To make the sign of the cross, read the Bible, go to church on Sundays, talk about Jesus, pray the rosary – for us, these are normal and everyday things. However, this is not the case in many parts of the world. Any one of these can lead to exclusion, imprisonment in a work camp or even death. The year began with an attack carried out on Jojo Cathedral in the Philippines during Holy Mass; 23 people were killed. Forty missionaries were murdered worldwide in 2018, 35 of these were priests. Two of them were massacred in late November together with 80 believers in a refugee camp in Alindao in the Central African Republic. One also should not forget Asia Bibi, the Pakistani mother who was sentenced to death on charges of blasphemy and only released from prison after 9 years. It is estimated that more than 25 Christians are currently incarcerated on the same charges. Also the Coptic Christians in Egypt are also under constant persecution. This calls to mind the pictures of the 21 Egyptians who were beheaded in 2015. In contrast, the murder of 33 Coptic pilgrims in 2017 and 2018 were virtually ignored. According to the Religious Freedom in the World Report of the Pontifical foundation ACN, Christianity is the most persecuted religion in the world. This fundamental human right is severely threatened in 38 countries – 17 of which are even classified as countries in which persecution occurs. “This prayer intention of the Holy Father is quite significant for the Christian community. Praying for our persecuted and discriminated brothers and sisters is one of the pillars of ACN. We support this prayer intention of the Holy Father with great joy and gratitude,” Thomas Heine-Geldern, ACN President, said. Thanks to a donation of 200,000 Euros from the Holy Father, following the auctioning of the Lamborghini that was given to him last year, ACN will be able to fund two new projects on behalf of the Iraqi Christian families and other minorities who have returned to their homes on the Nineveh Plains. On 15 November 2017, the Holy Father decided to give ACN part of the proceeds from the auctioning of the Lamborghini Hurricane that had been donated to him by the famous Italian carmaker. Now ACN will give concrete form to the Pope’s gesture by funding the reconstruction of two buildings of the Syriac Catholic Church, destroyed by the war. They are the nursery school (kindergarten) of Our Lady and the multipurpose centre of the parish of the same name. Both buildings are in the village of Bashiqa, just 30 km from Mosul. The village was badly damaged during the war, but the Christian community has returned and in large numbers. In fact, by now 405 of the 580 homes that were destroyed here have already been rebuilt and around 50% of the Christians, or 1,585 people, have already returned. Totally destroyed multipurpose hall of St Mary, in the Syriac Catholic town of Bashiqa. The two projects funded with the money from the Lamborghini will also benefit the other minorities in the town, since the multipurpose centre, which has a capacity for over 1,000 people, will be used for weddings and the religious feasts of all the various different communities. It will be the largest such centre in the area and will be available for use to over 30,000 people of all different faiths and ethnic groups. 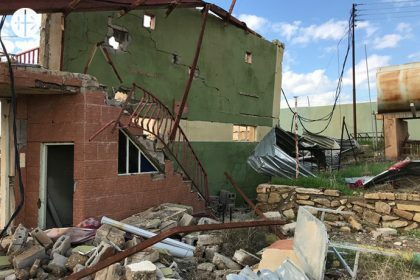 Just a little over two years since the liberation of the villages of the Nineveh Plains, the number of Christians who have been able to return to their homes has exceeded even the most optimistic predictions. By 11 January this year at least 9108 families had returned to their villages, or almost 46% of the 19,832 families dwelling there in 2014 prior to the arrival of so-called Islamic State. 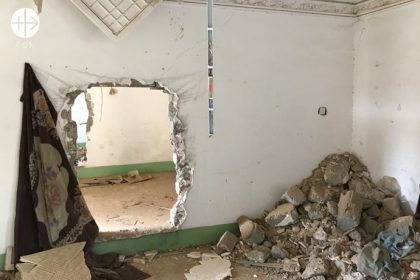 This is thanks above all to the immense work of reconstruction – to which ACN has greatly contributed – that has made it possible so far to rebuild or repair some 41% of the 14,035 homes destroyed or damaged by IS. Partially destroyed Virgin Mary Kindergarten, in the Syriac Catholic town of Bashiqa. This intervention, in which the pontifical foundation ACN has played a major role in collaboration with the local Churches, has also found a generous benefactor in the person of the Holy Father. Already back in 2016, Pope Francis gave 100,000 Euros in support of the “Saint Joseph Charity Clinic” in Erbil, which provides free medical assistance. This most recent gift by the Holy Father will be a further help to local Christians, enabling them to live their own faith and offer a future in Iraq to their children. At the same time, it is a powerful message and an invitation to peaceful coexistence between the different religions in a region where fundamentalism has sadly done grave damage to interreligious relations. Since 2014 and up to the present day ACN has given over 14 million Euros for the support of Iraqi Christians. 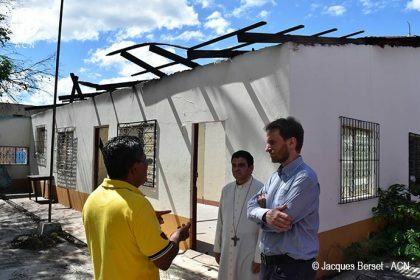 Marco Mencaglia, head of the Latin America section of Aid to the Church in Need, visited Nicaragua in November. The objective of his trip was to learn more about conditions in the country first-hand and to assess how the pontifical foundation has worked with the local church up until this point and how they can continue to work together. Last year, Nicaragua experienced a series of intensive and violent clashes between the government and opposition groups that lasted for about three months from 18 April to mid-July. During this period, the clashes claimed hundreds of lives – most of them young protesters. However, the exact number of victims is disputed: the government has estimated 150 dead, other sources say the figure is over 500. The Catholic Church played a decisive role in ensuring that the clashes between the armed government forces and the protesters – most of them students – did not cause even more casualties, both dead and wounded. What is the current situation in Nicaragua? Although officially, there have not been any further violent clashes since July, the political climate in the country remains extremely tense. At this time, the fate of the young people has yet to be decided. Hundreds of them are still incarcerated in prison for political reasons relating to the suppression of the protests. Less blatant forms of discrimination also have a negative impact on life in the country. Marco Mencaglia, head of the Latin America section of Aid to the Church in Need, visited Nicaragua in November. What role did the Catholic Church play during this time? Many people deplore the absence of the basic requirements for democracy. The Catholic Church is playing a decisive role in finding a peaceful solution for the conflict because it is an institution that is deeply rooted in society. What impressed you most during your trip? The courage of the Church as it worked to prevent even more violence during the months of conflict. The protest organisers closed off the main roads in many regions of the country, bringing life to a standstill in the country for weeks. We saw many photos showing priests in, particularly tense situations, standing with arms raised between armed government forces who were about to take down blockades by force, and protesters who had resolved to show resistance. By risking their own lives, these priests, most of them young men, saved the lives of many young people on both sides of the conflict. They prevented the street blockades from ending in violence. Many of the churches took in hundreds of wounded, converting church buildings into makeshift field hospitals. In spite of the campaign to discredit the Church, recent, independent surveys have shown that the Church as an institution continues to enjoy a very high level of credibility. The number of vocations to the priesthood continues to rise practically everywhere in the country. Each year, new parishes are founded in different dioceses. Others are adding to the number of centres for lay education. The number of applications received from people interested in taking part in educational courses offered by the Church is also growing. The last diocese to be founded in Central America is located in Nicaragua: the diocese of Siuna, established in late 2017. 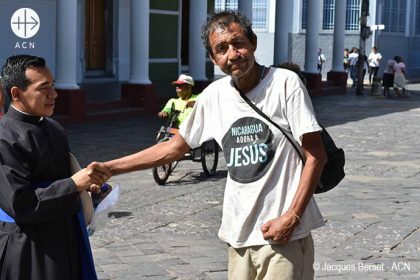 Mgr Jorge Solórzano Pérez, Bishop of Granada, during the distribution of a meal for the poor of the city – Poor man wearing a T-Shirt with the slogan “Nicaragua loves Jesus”. Is there a way out of the crisis? The Nicaraguan Church has said time and again that the only way out of the crisis is through dialogue and by supporting a process that ensures that the fundamental rules of democracy – free and fair elections – are respected, and that channels the energy of young people for the good of the country. It is important to avoid starting new conflicts and to involve all of the relevant social actors in the country. I would even go so far as to say that there is no peaceful way out of the current situation without the involvement of the Church. At a spiritual and social level, the Church continues to play a decisive and unique role in Nicaragua as it moves along the difficult path to healing the deep wounds left by the conflict that raged from April to July. What does the Nicaraguan Church need? First of all, the local Church has to remain unified. In spite of the great differences in personal biographies, attitudes and pastoral contexts, the bishops have always been able to show a remarkable solidarity with one another. It is necessary to pray for the people who have distanced themselves from the Church for political reasons, that they may return to the community of the Church. These are difficult processes that quietly continue to move forward in spite of the many problems. During these precarious times, the Nicaraguan Church needs to feel the solidarity of the world Church in prayer and its ongoing attention. What help can ACN provide through the involvement of its benefactors? In response to the remarkable increase in vocations, beginning in 2019 the Church in Nicaragua has decided to set up new philosophical seminaries for candidates to the priesthood at a regional level. These will be in addition to the existing diocesan seminaries in Managua and Granada as well as the national seminary in Managua, where students from the five other state districts can continue their theological studies. The new, improvised seminaries will need worthy facilities to be able to accommodate the young students. Furthermore, ACN is assisting in the process of founding new parishes in various dioceses of the country by building small churches and parish houses. These are being built in isolated areas and the communities are happy to finally have a priest living among them. 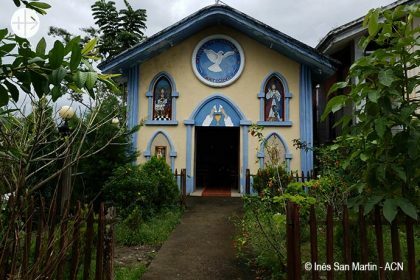 Quite often we have witnessed how the presence of a priest can change the life in a village in Nicaragua: in addition to his liturgical and sacramental duties, the priest is often a point of orientation in the day-to-day life of the entire community. ACN also offers support for the formation of young lay people. As we mentioned above, during the protests young Catholics became the targets of the most severe attacks. They were robbed of their rights, threatened, thrown into prison and beaten. Many of them fled the country to seek refuge abroad. Many others lost their jobs because of the economic crisis and have no prospects for the future. We have to reach out to these young people so that their wounds can heal and they can discover the love of God in spite of all their suffering and anger.